Elodie Winslow, an archivist who works in London, discovers a leather satchel with an old photograph of a woman in Victorian clothes and a drawing of a large old house situated along a river. Elodie feels something is drawing her to this house. It reminds her of a story her mother used to tell her when she was a small girl. Some 150 years ago, the painter Edward Radcliffe led his friends to the Birchwood Manor located along the banks of the Upper Thames river intending to spend the summer month in seclusion to focus on their artistic works. But many things happen during those fateful days. A woman gets killed and another one goes missing. A priceless heirloom disappears, and Radcliffe's life is never the same again. Elodie resolves to travel to visit the house which could uncover mysteries. 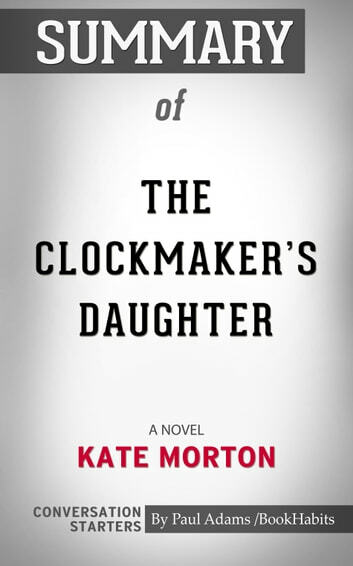 The Clockmaker’s Daughter is an instant New York Times bestseller. 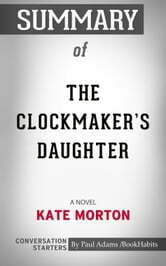 All of Kate Morton’s five other books are bestsellers including The Lake House and The Distant Hours.